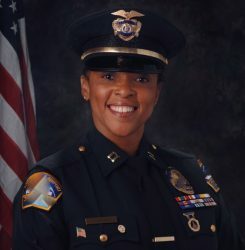 Captain LaPonda J. Fitchpatrick (Retired), was responsible for ensuring the safety, security, and regulatory compliance of the global gateway known as LAX and its satellite airports for over 30 years with the Los Angeles Airport Police Department (LAXPD). LaPonda conceived and implemented the LAXPD Homeland Security Section that ensured ensure multi-agency law enforcement, public safety activities and responses were properly coordinated to reduce vulnerability to a terrorist event or catastrophic emergency. This included the development of the nation’s largest airport law enforcement bomb detection K-9 unit, expedited multi-agency intelligence sharing, an onsite tactical response team tailored to the aviation environment, and aviation specific training provided nationwide and internationally. An internationally recognized aviation security and law enforcement consultant, LaPonda has developed security systems, procedures, and professional standards that are utilized by a myriad of local, state, federal, and international agencies that secure the global aviation environment. She is a graduate of UCLA.